For the last month, I’ve been trying out the site 4thewords.com. It is a site that gamifies writing. 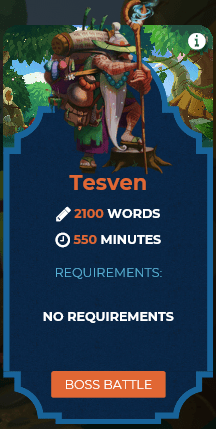 You fight monsters, complete quests, and level up based on how many words you write. The monsters are defeated by writing a certain number of words in a time limit. There are a wide variety of monsters, ranging from 100 words to above 1,000, depending on if you want to sprint, or are looking for a longer writing session. Quests vary from fighting monsters for various drops, writing a certain number of days in a row, and fighting bosses. Before I started using this site, I had been writing mainly one day a week. With the quests motivating me, I’ve managed to get something written most days of the week. A lot of my words have been journaling, or copying over emails, but I have still been more productive than before. Good thing they keep everything I write private, unless I want to publish it. But I don’t plan on putting my finished stories up for awhile. 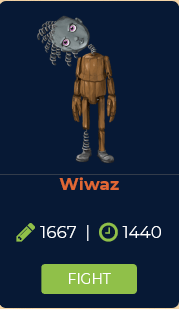 One thing I really like about their word counter is that deleted words still count. I’m constantly deleting the previous sentence because I thought of a better way to reword it. Also it works for editing. I do my editing in scrivener and then copy over the previous text. The program is smart enough to take the diff and count the words that have been added to the scene in the new copy. There is a NaNoWriMo event going on now, with special monsters and collectibles. Because they have been trying out some new features, there have been some bugs that the programmers have needed to work out. But they are pretty responsive, and keep everybody informed. Some of the gameplay isn’t intuitive, but there are forums where I’ve been able to get my questions answered just by reading around. This site makes money on a subscription basis. Everyone gets 1 month free trial. After that, a month costs $3-$4 depending on how much you buy in bulk. You can get a free month for referring a friend. My referral code is RPFFF07932 and if you wish to friend me, my username is Reigheena. I’ve just paid to continue, and I’d love to see you there!